This is a history of the family of religious benefactors, the Aduk Lakar Tsang from Trehor, a region that is also called Hor Ser Dara Khag Nga, located in the part of Eastern Tibet known as “The Four Rivers and Six Ranges.” The story of this great family, whose fame extended throughout all three provinces of Tibet, is based on recorded interviews with Mayum Pema Tsering Wangmo. It did indeed come to pass that the Lakar family’s fortune and prosperity grew far greater, but not only that, they used their wealth to become unbiased patrons of all the major orders within Tibetan Buddhism. 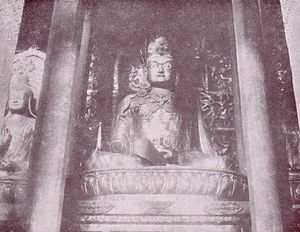 They sponsored Jé Tsongkhapa himself when he went on his debating rounds, and it is well known that they supported the great annual prayer festival in Lhasa, the Mönlam Chenmo, which Jé Tsongkhapa first established in 1408. In fact, each time this festival was held, every year up until the Communist Chinese first entered East Tibet in the 1950s, the Lakar family donated gifts of tsampa, tea and butter to all who participated. Mayum-la remembers that they had a tradition of giving each and every monk a silver coin (tam) and a measure of tea.. There are different explanations as to why the Lakar family’s region was called Hor Ser Dara Khag Nga, or the Five Territories of the Hor Ser Chiefs. According to one explanation, this originated when Chögyal Pakpa (1235-1280) had been invited to China by the Mongol emperor Kublai Khan. On his way back, he was accompanied by the son of King Hor Ser Chen and predicted that the king would have a son born in that region, whose descendants would settle there. Another tradition explains how it dates back to the Lakar family’s patronage of the Mönlam Chenmo festival in Lhasa. One day, the sponsors were invited to an audience before the assembly and made to stand beside an enormous table, upon which different kinds of food had been arranged in huge quantities. The representative of the Lakar family lost his balance while prostrating; and, as he stumbled, knocked over the table stacked with food, causing a great shower of grains and other foodstuff to fall onto the assembly of monks, all of whom fell about in uncontrollable laughter. When Jé Rinpoche saw this he thought it was a wonderful sign, and foretold how the beneficence of the Lakar family would bring joy to the monasteries of Tibet for many generations to come. Indeed, from that time onwards the Lakar family grew increasingly prosperous and became patrons of all the major monasteries in Tibet. For the Nyingma school, this meant the monasteries of Dorje Drak and Mindroling in the upper regions, Shechen and Dzogchen in the middle regions, and Kathok and Palyul in the lower regions; but especially, the monastery of Dzogchen and all its throneholders, beginning with the great Dzogchen Pema Rigdzin (1625-1697). For the Sakyas, this meant all the monasteries, headed by the three seats of Sakya, Ngor and Tsar, and all their lamas and incarnations. For the Kagyü, this meant the monasteries, lamas and tulkus of the Karma, Drukpa, Drikung, Taklung and other traditions, headed by the Gyalwa Karmapa and Palpung Situ. And also for the Gelugpa, it meant all the major lineage holders, beginning with the three main seats of Sera, Ganden and Drepung. In short, it is said that there was not a single monastery, great or small, in the Land of Snows that did not receive the family’s help. For example, in a small Kagyü monastery called Dzari Gulgön, there was a droma root called the “Lakar droma”, which remained there continuously. There are no surviving accounts from the lives of Mayum-la’s ancestors of these early generations, and noone today can remember even their names, but there are accounts of the family dating from as recently as three or four generations ago. The family at this time was headed by Lakar Jamyang (who was said to be an emanation of Dzambhala, the god of wealth) and his brother Kalu. They were both married to a girl called Gyatso Drönma, who was considered to be the daughter of a protective deity called Dongchen Nyanya, and had a spontaneously arisen mark on her right arm in the shape of a fish. Their two sons, Ya-ho and Tsok-ho, were to become known as emanations of the Buddha’s famous patron Anathapindada. It was during this period that the family became famed for never saying no, and its charity reached an unimaginable scale. This was also the era of the famous masters Jamyang Khyentse Wangpo (1820-1892), Jamgön Kongtrul (1813-1899), Chokgyur Dechen Lingpa (1829-1870), Dza Patrul Rinpoche (1808-1887) and Mipham Rinpoche (1846-1912). The Lakar family helped these and other masters, and supported their monasteries whilst at the same time giving alms to the poor and needy. They were able to give whatever was needed, as if they were granters of wishes. There are stories from this time describing how the family was involved in trade between China and Tibet, and how they transported many train-loads of gold, silver and other goods to and from the stations. Ya-ho and Tsok-ho both married a daughter of the Aduk family called Tsering Lhamo, who possessed the marks of a dakini, and was the aunt of the sixteenth Gyalwang Karmapa, Rangjung Rigpé Dorje (1924-1981). Following the advice of His Holiness the Thirteenth Dalai Lama and those who warned that an era was coming to an end, the Lakar brothers divided their wealth and gave half away to religious projects. Whereupon, as a sign of the infallibility of karma, their wealth grew even greater! People even began to say that the Lakar family’s gold and silver must be breeding! The family conceived a plan to offer to every Nyingma monastery a set of three statues portraying Khenpo Shantarakshita, Guru Padmasambhava and King Trisong Deutsen, to every Kagyü monastery three statues of Marpa, Milarepa and Gampopa, to every Sakya monastery a set of statues depicting their own five patriarchs, and to every Gelugpa monastery three statues portraying Jé Rinpoche and his two main disciples. In Dzogchen monastery, the statues of the Khenpo, Guru and King were made from gold and copper. The main figure rivalled in size the great Maitreya Buddha statue in Tashilhunpo. The Guru’s statue had five different necklaces, and the King’s had three. Later, when Dzogchen Monastery burned down in a fire, the flames could not reach the Guru’s necklace because it was too high up, and the King’s necklace too was rescued. They were both used towards the cost of rebuilding. These were not the only statues they funded; there were also images of the eight great bodhisattvas, the hundred peaceful and wrathful deities, a thousand Guru Rinpoches, a thousand Buddhas and the three long-life deities. The family also made vast donations towards images made from gold and silver and other precious substances. And that was just at Dzogchen Monastery! They also helped construct statues at many other monasteries. To put it simply, whenever a monastery or a lama needed support or contributions towards a project, they would always turn to the Lakar family. And the family also helped the rest of the population by giving food, clothes and medicine, and assisting those in danger. 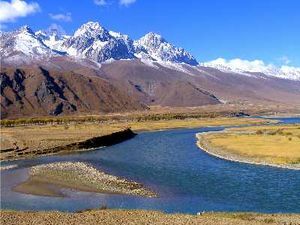 On one occasion, for example, a Chinese official was passing through a town called Arab Nang in the Dza region on his way to Lhasa, when he was attacked by bandits and left to die. Some time later the Chinese captured all the people of the town and sentenced them all to death, but the Lakar family was able to save hundreds of lives by offering to pay five thousand weights (Wyl. srang) of gold in compensation. On another occasion, when a severe famine struck the area of Do-mé, the Lakar family provided food and grain to all who were affected. There was a saying at the time, well known even outside Tibet, which went: “The rich Chinese are richer than rich, but the poor Chinese are poorer than poor,” and this was especially true of the Chinese porters who used to carry tea up to the Tibetan border at Dartsedo. They were exceptionally poor and, because of the heat in China, some of them would arrive wearing nothing more than a pair of short trousers. Many died from exposure. In order to help them, the family had sacks made from woollen cloth and sent them regularly to the border, filled with supplies of warm clothing and food. In every generation the Lakar family served the Tibetan government of Ganden Podrang. Every year they would bring supplies from China, and they would make a special point of buying ‘sugar horse teeth,’ which were a particular favourite of the Thirteenth Dalai Lama. During the reign of this Dalai Lama, the Lakar family fulfilled his wishes by increasing its sponsorship of stupas at the Border Taming temples (ta dul) and Further Taming temples (yang dul), dedicated towards continued stability in the religious and secular life of Tibet. The family also made regular contributions towards the cost of food for the monks of Namgyal Monastery. In recognition of their services, and in order that they might bring even greater benefit to people, the Thirteenth Dalai Lama Thubten Gyatso issued a special decree granting the Lakar family permission to use all the salt mines in Tibet. It is undeniable that the Lakar family enjoyed exceptional wealth for many generations and employed many merchants and traders; even so, they themselves were genuine Dharma practitioners who did not engage much in business dealing. Ya-ho and Tsok-ho, for example, were both disciples of Dza Patrul Rinpoche and Ju Mipham Rinpoche. Although the Lakar family had always been chieftains in Hortö, Dza Patrul and Ju Mipham both advised the brothers that in the current age they would do better to surrender their office. On this advice, they made repeated offers of resignation, but when these offers were refused, they were forced to continue in their posts for several years. All the while, they persistently pleaded for resignation, until finally, when they explained that their level of support would not diminish and it was only the title of chieftain they wished to pass on to Tsého, the elder brother of Ashé Tsering Lhamo, their request was accepted. The two sons of the next generation were Lakar Tutob Namgyal, who was an incarnation of Tertön Nyima Drakpa (1647-1710) and just like another Anathapindada, and Sonam Tobgyal, who was an emanation of Gönpo Tsokdak. The elder brother, Tutob Namgyal, put such effort into studying the scriptures from an early age that he grew to be as learned as a senior khenpo, and was also an exceptionally skilled medical doctor. Sonam Tobgyal, the younger brother, was said by many masters to be an emanation of the protective deity Gönpo Tsokdak. Although he was recognized as this protector from the brown Sergyi Drongri Mountain in Golok, he was never to take up his seat. The Fifth Dzogchen Rinpoche Tubten Chökyi Dorje, said that, except for a short time spent there in retreat, it would be better if he did not stay too long. He did undertake a retreat, and he visited the shrine there, which none but his previous incarnations had been able to enter. Inside, he noticed that the protector’s coat and staff had disappeared. He invoked the deity for several days, until the missing items returned, producing confidence in all who were present. Whilst on his way to Lhasa on a pilgrimage, local deities would come to meet him, and his servants saw him carrying on conversations with them. When he arrived in Lhasa, the government gave him a formal welcome, and as he circumambulated the Jokhang his magnetism and spectacular presence were so powerful that everyone, great and small, could not help but rise to their feet as he passed. Tragically, due to some unfortunate circumstance, he fell whilst making offerings at Samyé Monastery and died when his body struck the famous self-arisen stone stupa. Some people took this to be a sign that he was an emanation of King Trisong Deutsen. Mayum-la heard that when his body was carried back to Lhasa, the wives of the aristocracy and other noble women went on top of their roofs to perform the rites for summoning prosperity (yang guk) using arrows of invocation (dadar). Tutob Namgyal and Sonam Tobgyal had two sisters. The younger one was a nun, and the elder, Pema Lhamo, was the consort of Yakzer Tertön, who was sometimes called Lakar Tertön, and was just like a second Guru Rinpoche. On one occasion, the diseases known as takten and nyagé were ravaging lower Tibet and causing many deaths. Lakar Tertön said, “We must prepare to go to the lake on top of the mountain peak tomorrow. Bring a flask of alcohol!” When they approached the lake the following day, he said, “Now you all stay here and recite the vajra guru mantra. Do not follow me!” and he went on alone. But Könchok Samdrup, Jordo and Tutob Namgyal followed him in secret and watched as the tertön went into the middle of the lake, surrounded by rainbow light. Suddenly, the water in the lake began to boil and he disappeared. After a short while, he reappeared surrounded once again by rainbow light and cradling a treasure casket in his robes. “This is a little tarnished,” he said, “But that is just the breath of the nagas.” So saying, he rinsed it in alcohol and made it clearer. This was how he revealed a treasure of extraordinary medicine and images of the Lords of the Three Families: Avalokiteshvara, Manjushri and Vajrapani. The medicine was sent to the affected area, where it wiped out the disease and saved many thousands of lives. Whenever any member of the Lakar family gave away medicine, they would always donate it free of charge, and refused to accept even so much as a silk scarf in return. The two brothers Tutob Namgyal and Sonam Tobgyal were married to Dechen Tso, the daughter of the king of Ling, Wangchen Tendzin, who was himself a direct descendent of Bumpé Gyatsa Shyalkar, the elder brother of the leonine warrior Gesar, the legendary manifestation of Guru Padmasambhava and patron deity of the Tibetan people. Dechen Tso had one son and two daughters, but the son did not live long. The younger daughter was an actual emanation of Jetsün Tara, named Khandro Tsering Chödrön (b.1929). When she was sixteen years old, she went to make offerings at a temple where the peerless master Jamyang Khyentse Chökyi Lodrö, whose kindness surpassed even the Buddha’s, was residing in poor health. Although the volumes of the Word of the Buddha (kangyur) had been recited a hundred times, it had not brought any improvement in his condition, and many masters were requesting that he take a consort, but he would not listen. They were offering him a statue of Jetsün Tara as a symbolic consort, when, just as they were checking for auspicious signs, Khandro Tsering Chödrön lost her way and inadvertently joined the ceremony. Everyone there took this to be a clear sign that she was destined to become his consort. Soon afterwards, his health improved and for many years he was able to work for the benefit of the teachings and beings, but so glorious and renowned were the celebrated achievements of his life that we do not need to retell them here. The elder sister, Pema Tsering Wangmo, was born (in 1925) with all the compassion of the dakinis, and pure faith and devotion beyond compare. She is the mother of Sogyal Rinpoche, who is now considered by many to be as precious as their very own eyesight, and whose fame has spread across the earth like the light of the sun and moon. Many masters prophesied that Sogyal Rinpoche would be born as the authentic incarnation of Tertön Lerab Lingpa. At his birth, there were many wonderful signs, such as rainbows arching over the roof of the house, and on that auspicious day there was not the slightest problem of any kind. Only six months later, the young child was invited to see Jamyang Khyentse Chökyi Lodrö at Dzongsar, the seat of the Khyentses. Whilst on the way, his father Jamga and mother Tsering Wangmo, as well as Ani Pema Lhamo, the male servant Tsering Pépé, the female servant Apé Lhadzom and many others heard him utter his very first words as he recited the vajra guru mantra aloud three times. Khyentse Rinpoche invited the party to join him for a special meal on an auspicious date, and when they went in to see him, everything had been prepared for an enthronement ceremony. As soon as Ani-la saw what was intended, she was amazed and said aloud, “What are you doing? He is the family’s only son. He can not be given away to anyone.” In response, Khyentse Rinpoche wrote a statement in his own hand, in which he clearly identified the boy as a genuine incarnation of Tertön Sogyal. On another occasion, when the family were in Hor, the young Sogyal tulku took three phurbas from under the carpet while he played in his room. His mother and father tried many times to discover whose they were, but noone claimed them, and they became objects of worship. Once, when he was playing in the Guru Rinpoche temple, he was heard shouting, “Come quickly! Guru Rinpoche is standing up!” But before anyone could get there, the Guru Rinpoche statue had sat back down again. The first to arrive later remarked how he had seen Guru Rinpoche’s khatvanga trident still rattling. Sogyal Tulku’s games were not like those of other children. For toys, he would use the ritual instruments from the monastery, and everyone observed how he was always well-mannered and polite. Rinpoche and the other members of the Lakar family travelled together with Jamyang Khyentse and a retinue of about fifty-five people to India. As he was passing away in Sikkim, Khyentse Rinpoche gave instructions that Khenpo Appey should take charge of Sogyal Tulku’s education. When studying with Khenpo Appey, the young Sogyal was always at the head of his class, and came first or second in examinations taken with many other lamas and tulkus. Later, when he attended school, he outperformed the other children to such a degree that he used to complete two years’ classes in a single year! Not only that, as he felt compassion and concern for his parents, he chose not to sleep at the school, and when his teachers asked him why he could not stay on the school premises, he replied that his parents were having difficulties, because they had no less than fifty-five old lamas in their care. After he finished school, Rinpoche accompanied the Prince of Sikkim to college in Delhi, and afterwards to England, where he studied at Cambridge, and gained an unrivalled knowledge of the religious traditions in the East and West. What followed, in terms of his service to the Buddhist teachings and his work to help beings, is so well-known that we shall not repeat it all here. While Mayum-la was pregnant with her youngest son, Dzogchen Rinpoche, she performed an offering to the goddess Tara in the presence of Jamyang Khyentse Chökyi Lodrö’s reliquary stupa (kudung) in the Palace Monastery at Gangtok. During the ritual, a nun went to fetch the offering water, but found to her surprise that, in place of the water, there was only milk. Khandro Tsering Chödrön joked, “There is not even enough milk for the people to drink, so it will be alright if we offer water instead.” But the nun insisted that there was no water, only milk, and Khyentse Rinpoche’s attendant was able to confirm this. At the actual time of his birth, the water once again turned into milk, and there were many other miraculous and auspicious signs. Dodrupchen Rinpoche, His Holiness the Fourteenth Dalai Lama and many other leading masters recognized him as the Seventh Dzogchen Rinpoche, the genuine incarnation of Jikdral Changchub Dorje (1935-1959). The interviews with Ma-yum Pema Tsering Wangmo were transcribed by Tashi Phuntsok. Dzigar Kongtrul Rinpoche and Ringu Tulku Rinpoche kindly read through the manuscript and made corrections. Alak Zenkar Rinpoche later clarified many difficult passages. ↑ He would have been sixteen years old at the time. ↑ Wyl. ja ‘bri dang, is a type of tea of the highest or second-highest grade Bag chung is a measure of brick tea, a quarter of a bag chen. ↑ Dara is a Mongolian word meaning chief. It is the equivalent of the Tibetan dpon po. ↑ The hierarch of the Sakya school who was recognized as the ruler of Tibet by Kublai Khan. ↑ Droma (Wyl. gro ma) is a sweet root that became a popular delicacy in Tibet. It was a particular favourite of the nomads. ↑ Fraternal polyandry was widely practised in Tibet until very recently. ↑ Anathapindada (Pali: Anathapindika), whose name literally means “Giver of alms to those without protection” was a wealthy householder and patron of the Buddha. He is most famous for having given the Buddha and his monks the famous Jetavana grove in Shravasti, where the first buddhist vihara or monastery was built. ↑ This fire happened in 1936, the year after the Fifth Dzogchen Rinpoche passed away. ↑ Wyl. Mani rdo ‘bum — a wall of stones carved with mantras such as om mani padme hum. ↑ This line is from a dharmapalas offering text known as Entrusting Activity to the Samaya-bound Dharma Protectors. The Lakar family sponsored the carving of woodblocks for the printing of several volumes of Mipham Rinpoche’s collected writings. ↑ Possibly because this was the site of the king’s own death. ↑ Wyl. ltag ‘then is a kind of stroke. Wyl. nya gas causes the skin on the calves to dry up and crack. ↑ This was the famous Lingtsang Gyalgenma, “The Old King of Ling,” a tertön famous for his terma related to Chandali, the consort of Amitayus, the Buddha of Boundless Life. Sogyal Rinpoche, besides being identified as an incarnation of Tertön Sogyal and Do Khyentse, was also recognized as an incarnation of Lingtsang Gyalgenma, his own great grandfather. This page was last edited on 8 August 2017, at 13:09.